در اثر وقوع انواع تهدیدات چه طبیعی و چه انسان ساخت، خسارت فراوانی ممکن است به زیرساخت‌های کشور وارد شود. یکی از این زیرساخت‌های حیاتی، سامانه آبرسانی است. از آنجایی که مهم‌ترین وظیفه این سامانه در زمان بحران، ناشی از وقوع تهدید، استمرار در انتقال آب به شهروندان می‌باشد، در صورت قطع استمرار عملکردی باعث تشدید بحران خواهد شد. از این رو باید با ارزیابی تهدیدات در سامانه آبرسانی، نقاط آسیب‌پذیر شناسایی شود و با شناخت این نقاط راهکارهایی به‌منظور آسیب‌پذیری ارائه شود. در این تحقیق ابتدا به ارزیابی دارایی‌ها و تهدیدات خاص مربوط به سامانه آبرسانی و در ادامه به ارزیابی شدت آسیب‌پذیری هر یک از تهدیدات احتمالی برای دارایی‌های مشخص شده پرداخته شد و در نهایت با محاسبه عدد ریسک هر یک از دارایی‌ها با استفاده از روش رمکپ، دارایی‌ سدها، مخازن به‌همراه ایستگاه پمپاژ، تصفیه‌خانه‌ها و چاه‌ها به‌عنوان واحدهای آسیب‌پذیر مشخص شدند تا بتوان قبل از وقوع بحران با استفاده از این راهکارها میزان آسیب‌پذیری را کاهش داد. از دیگر نتایج این تحقیق مشخص شدن تهدیدات پایه تأثیرگذار بر این سامانه شامل آلودگی آب، حملات موشکی و سپس حملات سایبری می‌باشد. Heavy damages might be inflicted upon national infrastructure due to a variety of disasters caused by natural events or human activities. One example of such vital infrastructure at risk is the water supply system. At the time of crises, the water supply system is expected to continue supplying water to citizens, or the crisis will be augmented. This warrants the potential threats and their effects on the system to be identified and evaluated in an attempt to determine the vulnerable systems and sites toward proper solutions. In this study, the assets and the associated threats of the water supply are identified followed by a vulnerability analysis. The RAMCAP method is then employed to determine values for the risks associated with each of the assets including dams, water storage systems, pumping stations, treatment plants, water wells, and building units. Methods are proposed to reduce these risks before a crisis occurs. In addition, basic threats due to air-missile and Cyber attacks are also considered. ASME. RAMCAP., 2006, "Risk analysis and management for critical asset protection-version 2.0", Innovative Technologies Institute, LLC, Washington DC. Aven, T., 2011, "On some recent definitions and analysis frameworks for risk, vulnerability and resilience", Journal of Risk Analysis, 31, 515-522. Brashear, J., Olstein, M., Binning, D. & Stenzler, J., 2007, Risk analysis and management for critical asset protection for the water and wastewater sector, 2nd Ed., WEF., USA. Federal Emergency Management America (FEMA)., 2003, Primer for design of commercial buildings to mitigate terrorist attacks, Risk Management Series, USA. Lee, M., McBean, E., Ghazali, M., Schuster, C. & Huang, J., 2009, "Fuzzy-logic modeling of risk assessment for a small drinking-water supply system", Journal of Water Resources Planning and Management, 135(6), 547-552. 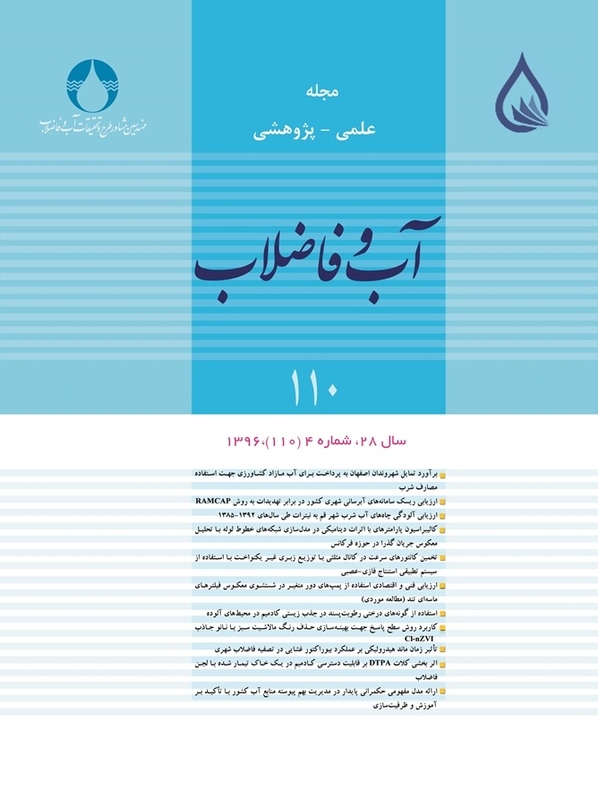 Nurollahi, H., Barzegar, A., Abadian, F. E., Soleimani, A. & Alikhani, A., 2015, "Developing a new model for risk assessment, combining critical infrastructure studies and spatial planning criteria", Journal of Emergency Management, 48, (7), 47-56. Rossi E. C., 2015, "Criticality and risk assessment for pipe rehabilitation in the city of Santa Barbara sewer system", A Thesis presented to the Faculty of California Polytechnic State University, San Luis Obispo In Partial. Sadiq, R., Kleiner, Y. & Rajani, B., 2004, "Aggregative risk analysis for water quality failure in distribution networks", Journal of Water Supply Research and Technology, 53(4), 241-261. Torres, J., Brumbelow, K. & Guikema, S., 2009, "Risk classification and uncertainty propagation for virtual water distribution systems", Journal of Reliability Engineering and System Safety, 94, 1259-1273. Vairavamoorthy, K., Yan, J., Gagale, H., M. & Gorantiwar, S.D., 2007, "IRA-WDS: A GIS-based risk analysis tool for water distribution systems", Journal of Environmental Modeling and Software, 22, 951-965.